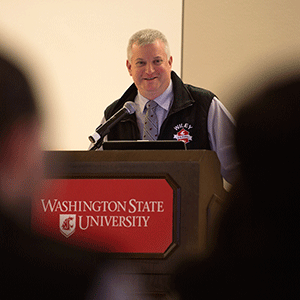 On February 19th and 20th, Eric Nyberg, Applied Materials and Performance group, had the privilege to participate in the 2015 Washington State University (WSU) Dr. William R. Wiley Research Exposition in Pullman as the keynote speaker. Eric addressed the attendees with a keynote talk at a dinner banquet Thursday night and started Friday with a plenary talk, which kicked off the day that graduate students gave oral and poster presentations on their various R&D projects. Eric's keynote address was related to how his education at WSU (BS and MS) was instrumental in obtaining a job as a metallurgical engineer/materials scientist, leading to a successful career in research and development at PNNL. He also described key and meaningful projects that he has worked on over the last 20+ years, including significant work on the U-10Mo alloy, as well as testing and production of other metallurgic alloys, such as Magnesium alloys and Ti-6Al-4V and Ti-1Al-8V-5Fe alloys. For more information, visit the Dr. William R. Wiley Research Exposition website.